This page takes a look back at some of the best teams and athletes in Hill City Track and Cross Country history. Listed, year-by-year are Rangers who have placed in state meet competition. Content for this page was compiled from the SDHSAA Track and Field Yearbooks, which include all of the individual place-winners and team scores each season . 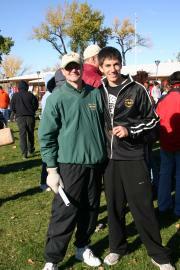 Coach Dan Asheim and State Place-winner, Jeff Newell at the 2005 State Cross Country meet.